Tahoe Cedar Lodge is a newly built North Lake Tahoe Lakeview vacation home offering spacious luxury in the Cedar Flat neighborhood of Lake Tahoe's North Shore. With a hot tub, pool table, five televisions, a landscape garden, and being dog-friendly, this vacation accommodation has everything you need for a great vacation! With its central location, this is a 5-minute drive to shopping, dining, entertainment, and nightlife in Tahoe City. In the other direction, this is a 10-minute drive to Kings Beach and North Shore Casinos. A 2-minute drive or 5-minute walk down the hill will bring you to one of the pebble beaches of Lake Tahoe, where people can swim and relax on the pebble beach. Down the road just before Tahoe City, there is boat ramp access next to Pomin Park for kids to run around and have fun on the playground. Guests of Tahoe Cedar Lakeview Lodge especially enjoy access to the extensive walking/hiking/cross country skiing trail network less than a 1/4 mile up the street. World class mountain biking awaits just out your front door, or follow the trails West into Tahoe City for a lakeside lunch! For winter guests, drive 15 minutes to world-class ski resorts such as Squaw Valley USA, Alpine Meadows Ski Resort, Northstar at Tahoe, or Homewood Ski Resort. 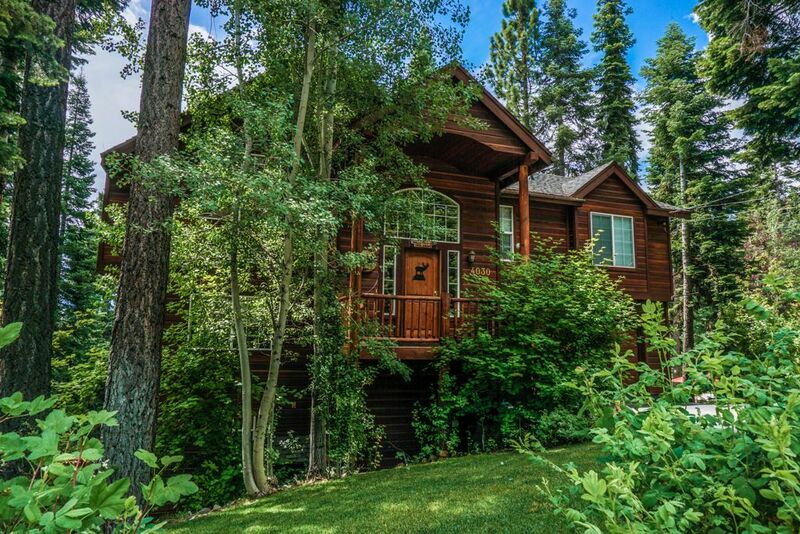 The Tahoe Cedar Lakeview Lodge is a dog-friendly vacation home, offering a spacious landscaped backyard or miles of walking trails just around the corner. Enjoy a stunning lake view amidst towering pines from the home's expansive living room windows or the private back deck. The interior decorating work of this vacation rental has been done with exquisite taste, and you will be mesmerized by the beauty of this home! Relax among classic Tahoe style wooden furnishings, hand carved railings and bar stools, and intricate decor. Tahoe Cedar Lakeview Lodge welcomes each guest into a large open kitchen, dining, and living area, filled with sunlight and views of Lake Tahoe and its surrounding Alpine peaks. This large open area renders this North Lake Tahoe vacation home perfect for getting groups of family and friends together! The kitchen offers ample counter space on all sides with a central bench with a cooktop and breakfast bar. The living room, centered around a cozy stone gas fireplace, includes a fully equipped entertainment center with television, cable and DVD player, and two large comfortable couches with a matching overstuffed armchair and ottoman. This large great room also offers a long dining room table comfortably seating 12 guests, an antique piano accompanied by songbooks, and access to a sun-filled deck with a gas BBQ, picnic table, and plenty of outdoor furniture. For after-dinner entertainment or a place for the children to get away, there is a wonderful brand new entertainment room with a pool table flat screen TV and access through a sliding door to a large outdoor hot tub. All bedroom accommodations include high-quality beds and beautiful new linens. The large master bedroom upstairs offers a King size bed, TV and VCR/DVD, and lake views. The accompanying master bath includes two sinks, a whirlpool tub, and glass enclosed shower. Also upstairs is a room with an endless supply of board games with a half bath across the hall. The third bedroom downstairs includes a queen bed, a comfortable reclining chair, and elegant bedside lighting, perfect for bedtime readers. The fourth bedroom downstairs offers a lake view, with a queen bed, large closet and a TV and a small entertainment center. The fifth bedroom also offers a queen bed, TV and its own private shaded deck. On the newly added lower level is a sixth bedroom with flat screen TV/DVD and master suite. The Tahoe Cedar Lakeview Lodge is in a great location to enjoy all that Tahoe has to offer in both summer and winter seasons! Cross country skiing and trail hiking access up the street.